This die cut definitely makes my heart bloom with love. I think it is just divine. Plus it is perfect for Valentine's Day coming up soon. Who do you know that would love a card like this? And I hope you realise that you can tell anyone you love them at any time, and not just on valentines Day. Imagine the surprise someone will get to receive a I Love You card randomly throughout the year. To make the variegated colours in the Bloomin' Heart, I spritzed a piece if whisper white card stock with several different colours of classic ink mixed with rubbing alcohol. I just filled a mister with the rubbing alcohol and added several drops of reinker. Then sprayed the card stock. I love how several of the colours mixed on the paper to create new colours. 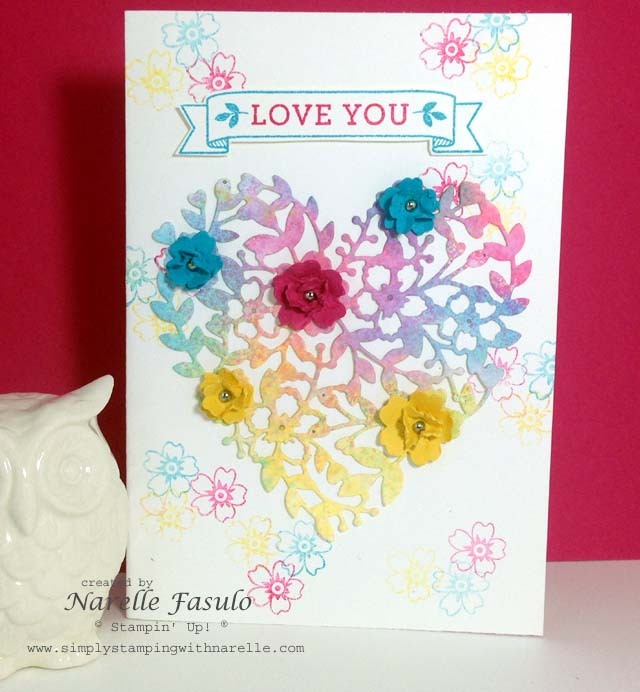 I then used the Bloomin' Heart framelit on this piece of card stock and ended up with a beautiful coloured heart. This die comes with a couple of small flower dies as well. So I cut out several of each size in a couple of the colours I had spritzed with. I layered two together and attached a small silver brad in the middle, then spritzed with water. While the flowers were still wet, I scrunched them to the middle and dried them with the heat tool. I thought the coloured heart by itself on the whisper white card front was a bit boring, so I stamped bunches of flowers that matched the colours I had used in the heart. As you know I am trying to enter more challenges this year. 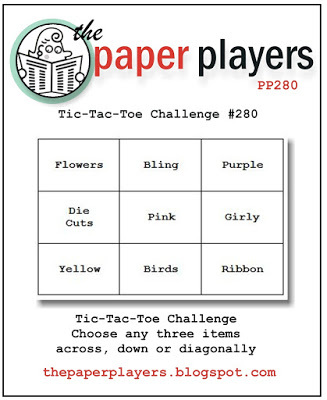 So how happy was I to see that this card fitted the current Tic-Tac-Toe challenge over at The Paper Players. This card fits the Flowers-Die Cuts-Yellow column perfectly. To see the products I have used in this card, be sure to chek out the Product List at the bottom of this post.